aking it to the finish line in a grueling 130-mile race would be an impressive feat for anyone. But when you consider that the winner, Amy Palmiero-Winters, was competing with a prosthetic leg against able-bodied runners, it's even more amazing. Amy, who lives on Long Island, New York, made history in January when she captured first place in the 24-hour Arizona Road Racers competition. She also became the first person with an amputation to qualify for a U.S. national track and field team. In May, she completed the 24-hour world championship in Brive, France, with 11 teammates. Amy wins 2010 ESPY award! by recognizing major achievements by top athletes. "Best Female Athlete with a Disability." For her accomplishments, Amy won the prestigious Sullivan Award this year. Called the "Oscar" of sports awards, it's presented annually to the outstanding amateur athlete in the United States. Past recipients include Michael Phelps, Michelle Kwan and Bruce Jenner. 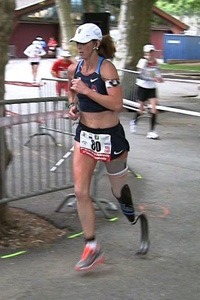 Although Amy, who is 37, is an exceptional athlete, competing with a prosthetic limb isn't easy. Her leg was amputated below the knee in 1997 following a motorcycle accident. A custom designed prosthetic leg, made by Erik Schaffer, C.P. 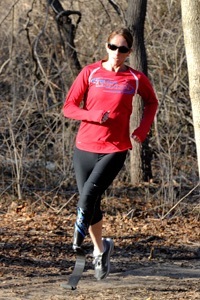 at "A Step Ahead Prosthetics" in Hicksville, NY, has enabled her to run ultramarathons. However, she has faced a number of medical problems that could have left her on the sidelines – if it weren't for the care she received at Hospital for Special Surgery (HSS). Amy credits a team of doctors at the hospital with resolving her medical issues and enabling her to compete as an elite athlete. The team of six physicians includes an orthopedic surgeon specializing in nerve injuries, a pain management specialist, a sports medicine physician, a radiologist and two physiatrists. Amy's most pressing problem were neuromas – painful masses of nerve fibers – that had formed near her knee, where her leg had been amputated. The neuromas caused severe pain when she put on her prosthesis and it pressed on the nerves, but she refused to stop running. When conservative treatments didn't help, Amy was referred to Dr. Scott Wolfe, an orthopedic surgeon with special expertise in nerve injuries. "Amy was sidelined by excruciating pain. But she didn't just come to us for pain relief. She wanted to be able to compete as an athlete at a very high level," said Dr. Wolfe, who is also Chief of the Hand and Upper Extremity service at Hospital for Special Surgery. "We consider a patient's medical issues and goals, and try to tailor the solution to resolve his or her specific problem." Dr. Wolfe determined that Amy's best chance to resume running in ultramarathons would be a delicate operation he would perform with Dr. Daniel Richman, a pain management specialist and anesthesiologist. Before the surgery, Dr. Ronald Adler, Director of the Division of Ultrasound at HSS, played a critical role. Doctors needed to know the exact location of the painful neuroma prior to operating. "Diagnostic imaging was an essential component to track the course of the nerve and localize the abnormality," Dr. Adler explained. Using high-level equipment at HSS, he was able to zero-in on the neuroma. Next, Dr. Adler administered an ultrasound-guided injection of pain medication. Drs. Wolfe and Richman wanted to confirm that Amy's pain could be relieved by the injection – a temporary fix. Once they were certain the injection worked, they knew surgery had a chance of resolving her problem for the long term. In the operating room, the first step was a procedure performed by Dr. Richman called cryoneurolysis, which uses extreme cold. "We use a special probe that has nitrous oxide gas that runs through it at high speeds. That freezes and deadens the nerve fibers," Dr. Richman explained. Next, Dr. Wolfe extricated the larger neuroma from dense scar tissue using loupe magnification, and buried it deep within a muscle so it would no longer cause problems. Finally, he identified and divided two smaller neuromas near the first one, froze them, and enclosed them microsurgically within a protective nerve conduit. The operation was a success, and less than two months after surgery, Amy participated in an Ironman competition in Brazil. Amy's history at HSS dates back to 2006, when she originally saw Dr. Brian Halpern, a sports medicine specialist, for numbness in her sound leg. He referred her to Dr. Joseph Feinberg, Director of Physiatry Electrodiagnostic Services, to find the cause of the numbness. He has been overseeing her care ever since. "The team approach is critical," Dr. Feinberg says. "Doctors at HSS have areas of super-specialization, so the patient sees someone who is highly skilled to deal with a particular problem. The doctors work closely together for continuity of care." Amy still sees Dr. Halpern. "When you're an amputee, your body gets beaten up pretty badly," she says. "Dr. Halpern monitors my sound side and keeps it healthy." "Patients may come in with a variety of issues. It's important to address the whole body - the entire system. We utilize all the expertise we have at the hospital to coordinate care for the best patient outcome," Dr. Halpern explains. Amy also receives care from Dr. Gregory Lutz, Physiatrist-in-Chief at HSS. He has administered steroid injections in her spine for a herniated disc. "She's an incredible athlete with a tremendous spirit. To function at such a high level is admirable," Dr. Lutz said. Amy says she owes much of her success to the support she has received from "A Step Ahead", the highly-regarded prosthetics company, to her trainers and to the doctors at HSS. "The doctors played a huge role as far as the successes I've had. They worked with my prosthetist, because you have to be comfortable in your prosthetic to do what I've been able to do," she explains. "With all of them working together, and all of them being the best at what they do, that made everything possible. Winning the Sullivan award, setting world records -- it's not something I do alone, it's something that we do together as a team." A single mom with two young children and the desire to return to running as soon as possible, Amy says she had another reason for choosing HSS for her surgery. "The better the surgeon, the better the doctor, and the faster the recovery. That's one of the main reasons I was at HSS – because they are the best." She often recommends HSS to people she meets who need an amputation. "They're the top doctors in the world. If you need to have an amputation, you want to have it done by the best. They're so up to date on everything – the technology, the new surgical procedures, they're very creative in their thinking." If Amy respects the doctors at HSS, they are equally impressed by her remarkable achievements. "You cannot be any more fit than Amy. She has the concentration and resolve of an Olympic athlete," Dr. Wolfe says. "It's exciting to be part of a collaborative solution, working with other health professionals to help a champion runner reach her goals," he adds. "The collaborative effect is far greater than the sum of the parts," Dr. Richman notes. "Amy's ability and determination is what got her back in the winner's circle. I can't overestimate the importance of someone's determination and drive to get better." Dr. Feinberg is also impressed. "Amy's achievements are some of the most remarkable I've ever seen." Amy is Director of Sports at "A Step Ahead", where she helps adult and child amputees build confidence and overcome their limitations by introducing them to sports. She doesn't plan to slow down anytime soon. Later this month she plans to run the Badwater Ultramarathon – 135 miles in California from Death Valley to Mount Whitney. The grueling race spans three mountain ranges in temperatures reaching 130 degrees. Her medical team at HSS will be rooting for her.